Baby teeth, also known as primary teeth, can be confusing for parents who are unsure how to handle loose or wiggly teeth. Do you leave them alone? Help pull them out? How can you tell if a tooth is ready to come out? Below are some helpful insights for dealing with baby teeth. Children have 20 primary teeth, which are often referred to as “baby teeth.” At about age 6, permanent teeth begin to push through the gums, and primary teeth become loose and fall out. By 12-13 years, most baby teeth should be gone, and almost all permanent teeth should be in. An interesting fact is while there are only 20 primary teeth, those primary teeth will be replaced by a second set of 32 larger permanent teeth, if we count the wisdom teeth too that come in between the ages of 17-21. When baby teeth are ready to be shed, they become loose or wiggly. The question asked by parents is whether or not they should help these wiggly teeth out or let them be. While most teeth will ultimately come out on their own, there may be times when the tooth might need a little encouragement to come out. In order to make way for a child’s permanent teeth, parents might need to assist their children in removing loose baby teeth. Some pediatric dentists suggest having the child wiggle or twist their own tooth, as they know how much pain they can tolerate. Some children like to wiggle a loose tooth with their fingers or push at it with their tongue until the tooth falls out. Others suggest that the parent take control, loosening it with firm, gentle twisting motions, or feeding children hard foods that require extra chewing. I like to recommend eating a popsicle or a slushy (sugar free) so it is so cold that it “numbs” the area and then your child will be able to tolerate more. 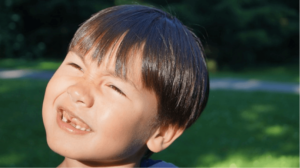 One suggestion is to first understand how the child is reacting to losing a tooth. Many children are excited because a lost tooth means the tooth fairy will leave a small surprise under their pillow for every tooth lost. However, other children might be anxious about the process of losing teeth. If that’s the case, it may be a good idea to have your pediatric dentist explain exactly what it means to lose baby teeth, and how exciting it will be to grow in strong, healthy permanent teeth. You may want to check with your dentist to get their opinion on pulling teeth at home. Sometimes permanent teeth will come in behind baby teeth, creating a double row called “shark’s teeth.” On rare occasions, baby teeth refuse to come out at all and need to be “wiggled” in the dentist’s office. If nothing seems to work and you’re confident the tooth is ready to come out, you can help remove the tooth using gauze (remember: no pulling!). If the tooth is ready, it will come out fairly easily. Have clean gauze on hand for any bleeding, and have something cold like an ice pop to alleviate any pain from the tooth coming out. Visit your pediatric dentist if you’re unsure about your child’s baby teeth. They can give you guidance on how to deal with all the wiggly teeth until the new, healthy permanent teeth grow in!